The Caribbean Court of Justice (CCJ) has been in the news quite often over the last year, especially in light of the highly-publicised, contentious Shanique Myrie case. On October 4 last year, the case concluded with the court ruling that Myrie should be awarded a total of Bds$75,000 or $3.6m Jamaican dollars. However, it was reported on January 18 that the CCJ lacks the mechanism to enforce the judgement. It is also in the news today as another Caribbean country, Dominica, has received Britain’s approval to make the CCJ its final court of appeal. This Fact Friday, we share some information about the CCJ, which was conceptualised as an alternative to the Privy Council as the final court of appeal for countries in the English-speaking Caribbean. The idea to establish a separate court of appeals for English colonies was first discussed in a March 6, 1901 editorial in the Daily Gleaner. The Agreement Establishing the Caribbean Court of Justice was signed by the CARICOM states of Antigua and Barbuda, Barbados, Belize, Grenada, Guyana, Jamaica, St Kitts and Nevis, St Lucia, Suriname and Trinidad and Tobago on February 14, 2001. St Vincent and the Grenadine and Dominica signed on two years later. 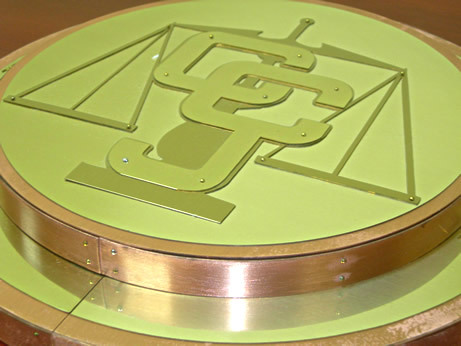 The Seal of the Caribbean Court of Justice (photo above) was designed by Brent Matthew and Shawn Chong Ashing of Trinidad and Tobago, following a CARICOM-wide competition in 2004. It was subsequently crafted in brass and teak by renowned Caribbean chemist, metallurgist and jeweller, Gillian Bishop.